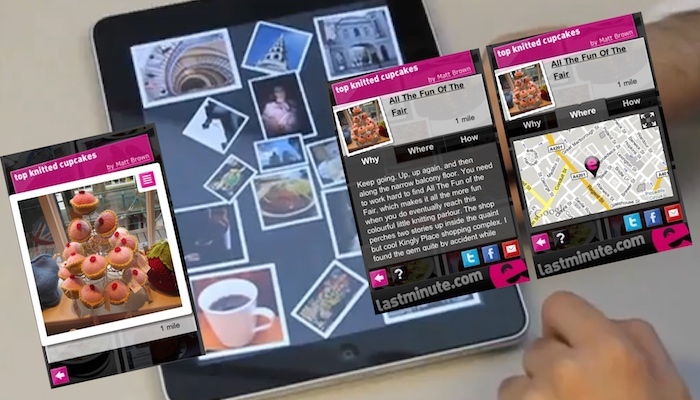 A personal favourite project: Topsee synthesized many ideas across a half-dozen-strong lastminute.com labs team. It was a beautiful user experience, designed for touch, sharing, discovery and great photography. It embodied psychological ideas about happiness through surprising discoveries, smart expectation-setting, storytelling. It rebelled against the prevailing idea of accessing the world through a search interface. It showcased the depths of local knowledge from a community of local bloggers. However, to be fair, we couldn't make it work commercially. Paris and New York were next but we never made it out of central London. There were many great experiences during the project. Carefully cropping the photo for London's top painting of breasts (the Candid Cafe on Torrens St) to avoid the wrath of Apple's App Store reviewers (although later this memorable entry from M@ went in). The launch party where we showcased all kinds of top things from around London. Being featured in the App Store. A 4* review from Macworld. Kim and Christophe's tongue-in-cheek video. Eating and drinking a lot of top things (purely in the interests of quality control). And of course the moving eyes in the logo.